Steins;Gate Volumes 1 & 2 are the first two of the three volume adaption of the the visual novel by 5pb & Nitroplus. If you aren’t familiar with the series, it is a story that is themed around time travel and the consequences that can result from it. It tells the story of the Future Gadget Laboratory and an invention which affects not only themselves, but also the future. The Laboratory is headed by Rintaro Okabe, an eccentric college student who proclaims that he is a mad scientist. (“It’s so cool!” Sonuvabitch“) He prefers to be called Hououin Kyouma, but is known to some of his friends as “Okarin”. He pretends that he is in conflict with “the organization”, pretends to talk to people on his phone at times, laughs maniacally at times, and has a huge interest in certain subjects such as time travel. Look in awe as you will never be this cool. The other members of the laboratory include Okabe’s air headed childhood friend, Mayuri, Daru, Okabe’s friend from high school who is a computer hacker and a bit of a pervert, the genius Kirisu, who Okabe frequently clashes with, the part timer Suzuha who works at the store below the apartment which the Future Gadget Laboratory meets at, Faris Nyannyan, a waitress at a maid cafe, Luka, the epitome of cuteness, but a dude, and lastly Moeka, an odd woman who prefers to send messages rather than speak face-to-face. 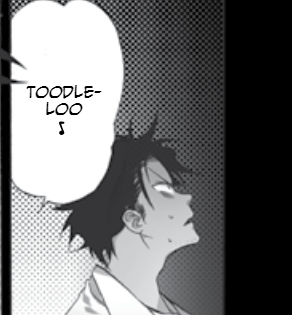 The characters all have their own charms (along with names Okabe made up) which make them likable. The members of Future Gadget Laboratory also have secrets or backgrounds that are deeper than you would initially think, which play a part in plot as it goes on. 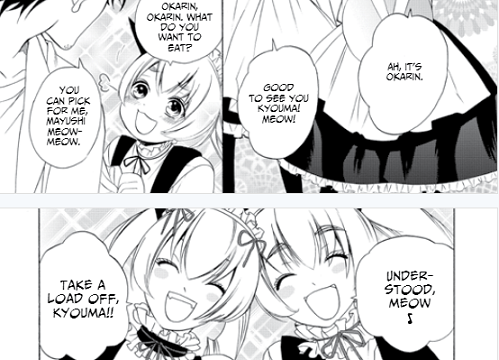 You can’t go wrong with a group of friends that include cat-themed maids. The style of the manga is a bit hit or miss. If this if your first time with anything Steins;Gate, the art direction is decent. The over exaggeration of character’s reactions to the more humorous moments are nice, and likewise the art also does well reflecting the tone when it becomes more somber. It definitely is not bad, but it isn’t really anything special. However, if you are more familiar with the visuals of the game, it may seem a bit off to you. I’ll admit for me the art style didn’t really feel like it matched with the visual novel. But, it did end up growing on me. The story so far seems to be following the “true ending” of the visual novel. That being said, the story is great and seeing it as a manga is nice way to experience it. In the two volumes, the manga is able to keep both the humor and seriousness that are present in the visual novel and anime series. Definitely not all of it, but we’ll get to that. That’s not the invention’s full name! There are a few issues with the manga. The biggest comes from the fact the visual novel takes over a dozen hours easy depending on how many endings you want to get, and the anime is 24 episodes. The manga on the other hand is only 3 volumes long. If you’ve played the game or watched the anime, you will notice that a number of things aren’t present in the manga. It’s not really surprising that some stuff was not going to be present in a manga adaptation. Even if this is your first experience with Steins;Gate, you will feel that it seems some parts are rushed such as with how fast certain plot lines are solved. Some of the lab members also definitely don’t get as much time as they should. If you really liked the way the visual novel explained certain things such as the scientific aspects, a lot of it isn’t really present. The translation is pretty good and this is not really a problem, but some of the spelling is different from what is used in the visual novel. It isn’t really a problem, but certain things won’t seem right when you read it. Even with the manga compressing some of the material from the visual novel, it is still worth a look. 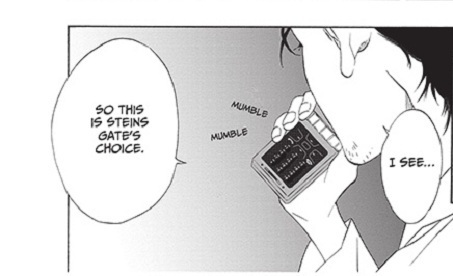 If you’ve never gotten into Steins;Gate before, this is not a bad place to start. If you are familiar with the series, experiencing it as a manga will still be good so long as you don’t mind how quickly it goes through the story. If you are just getting into the series and do pick up the Steins;Gate manga and enjoy it, I do recommend playing the visual novel which is available on a number of platforms, or to watch the anime series. Hopefully, if there is enough interest in bringing the manga west, it maybe a sign we will see some more of the series besides Steins;Gate 0, such as the film, some of the spin-off games, or maybe something else. Both volumes of the manga were provided by Udon Enterainment. The third volume of the manga is also now available.